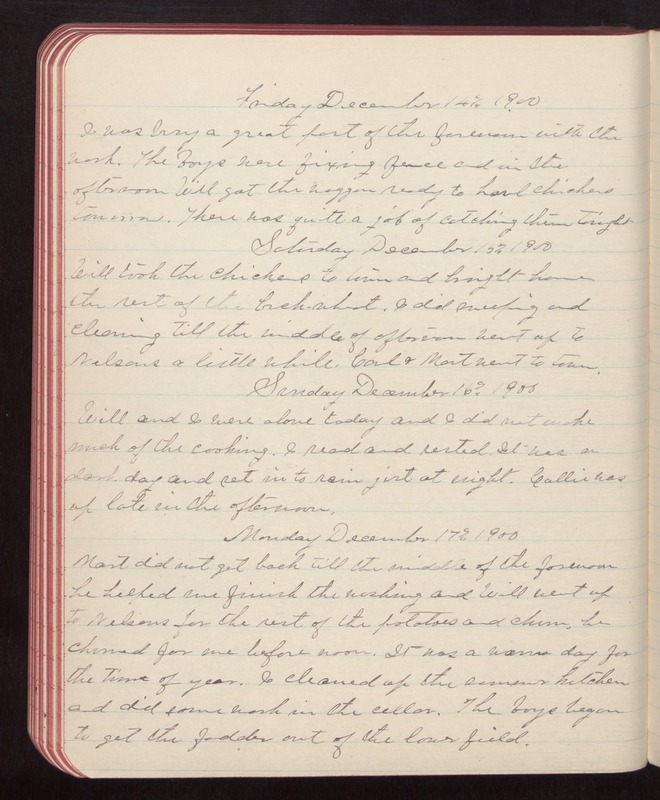 Friday December 14th 1900 I was busy a great part of the forenoon with the work. The boys were fixing fence and in the afternoon Will got the waggon ready to haul chickens tomorrow. There was quite a job of catching them tonight Saturday December 15th 1900 Will took the chickens to town and brought home the rest of the buck-wheat. I did sweeping and cleaning till the middle of afternoon Went up to Nelsons a little while. Carl & Mort went to town. Sunday December 16th 1900 Will and I were alone today and I did not make much of the cooking. I read and rested. It was a dark day and set in to rain just at night. Callie was up late in the afternoon. Monday December 17th 1900 Mort did not get back till the middle of the forenoon he helped me finish the washing and Will went up to Nelsons for the rest of the potatoes and churn, he churned for me before noon. It was a warm day for the time of year. I cleaned up the summer kitchen and did some work in the cellar. The boys began to get the fodder out of the lower field.